M.A.C.H.1 is making a comeback! 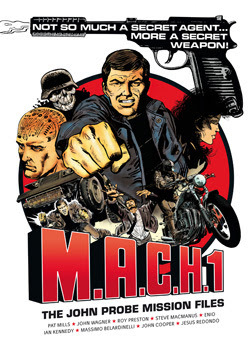 As one of the first comic strips found in 2000AD, M.A.C.H.1, a combination of the Six Million Dollar Man and James Bond, has finally been collected into one exciting volume. This comic created from a compilation of creative genius’ such as Pat Mills (ABC Warriors, Nemesis the Warlock), John Wagner (Judge Dredd, Strontium Dog, The Boogie Man), and Steve Macmanus, follows the British secret agent, John Probe, who is selected to receive a high-end surgical procedure known as ‘compu-punctre’, where electro-needles are inserted into his body similar to acupuncture, ultimately giving him the strength of 50 men. The acronym M.A.C.H. stands for Man to be Activated by Compu-puncture Hyperpower. The entire process takes many months before it is complete, and the final step is to attach computer circuits directly onto his skull, which will help him determine the best way to complete his missions. The computer also gives him special abilities every now and then that allows him to perform tasks he’d never done before, such as flying an airplane, or driving an armored car. One of the few downfalls is that the hyperpower makes him extremely hyperactive, and he has trouble sleeping or relaxing for long periods of time. The character that is created through John Probe is someone who is wholly controlled by technology. His character grows more in-depth with each story, and he finds himself doubting his own humanity at times as the computer in his brain will often give him suggestions that go against his own virtues. This in turn creates a quarrel within himself until eventually he begins to disobey the computer’s instructions all-together. He even will sometimes challenge the sincerity of the British government, and it is obvious that they are using him as their own personal killer in an effort to further their own agenda. This produces themes that are more adult in nature. Probe can be seen battling terrorists, spies, and other threats to national security, but when he combats extra-terrestrials that have taken over a town he begins to realize someone is pulling his strings. Like the many creators involved, there are also multiple illustrators who worked on this comic, most notably is Enio. While some show attention to detail within the characters themselves, others put Probe’s newfound abilities more on display. An example is when he is running at 70 mph towards a door that is nuclear blast-proof. The scene really showcases his immense speed and powerful strength. While the majority of the volume is in black and white, there are a few full color pages mixed in which are beautifully rendered. The colors are bright and vibrant and graphically detailed, and deserve to be turned into full blown posters. This volume is a must have for any John Probe fan. It came out March 21, 2018.